On 19-22 August 2014, Drs. John Hickey and Stan Gibson from the USACE Hydrologic Engineering Center (HEC), on behalf of ICIWaRM, conducted a four day training course and workshop at the Hydraulics Department of The National University of La Plata (UNLP), Argentina. The primary objective of this training effort was to build capacity in modeling related to environmental flows. 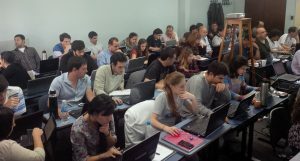 The course involved advanced training in the River System Analysis Model (HEC-RAS)—a free software system for water surface profile computations, sediment transport computations, and water quality analysis. Participants were then introduced to HEC’s Ecosystem Functions Model (HEC-EFM)—a free planning tool that aids in analyzing ecosystem response to changes in flow regime. In addition, the instructors worked on several HEC-RAS models the participants had brought with them during lunch, breaks and in the evening. They also met separately with representatives of the water division of the Argentine Ministry of Infrastructure. The ~45 attendees were from six countries, approximately half of which were graduate students and professors from UNLP and other universities, and half practicing engineers from the public and private sector. 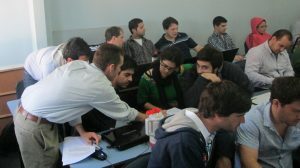 In addition to ICIWaRM and UNLP, the events were co-organized by the Erasmus Mundus International Master in Ecohydrology funded by the European Union, the Argentine National Water Institute (INA), the Provincial Direction of Sanitation and Water Works (DIPSOH), and the International Hydrological Programme of UNESCO, through the Regional Office of Montevideo. Figures. Instructors and participants in the HEC-EFM training course (Credit: Stan Gibson).